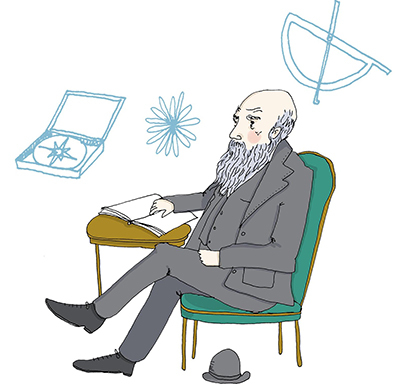 On the eve of Darwin Day, a book about him is published by one of our Research Associates to foster young children's curiosity about the natural world and stimulate their interest in science. Anna and Evan Meet Charles Darwin can be read online at no cost (see right). It is also available on Amazon in Kindle and paperback editions. The profits from sales of the book will be used to fund the production of the next book in the series. Its publication coincides with Darwin Day on 12th February, a worldwide celebration to commemorate Charles Darwin's birthday. The day highlights Darwin's contributions to science and promotes science in general. In the book, Anna and Evan go on a magical adventure to the Galapagos Islands where they meet Charles Darwin, discover unusual animals and learn some interesting scientific facts. They find out that birds have differently shaped beaks depending on what food they eat, and learn why African elephants have such large ears. The book was co-written by Dr Tanya Hutter, a Research Associate of the department, who herself has two young children. Tanya is a former Fellow of the L’Oréal-UNESCO UK and Ireland For Women in Science programme, and the programme also supported her in writing this book. Tanya says: "When my daughter was four, I was looking for books to read to her. I could find lots of titles about princesses and unicorns. But as a scientist, I wanted to encourage her to learn about science, and to question how things work and why. When I looked for those kinds of books for children of her age, I couldn't find them. So I got together with a friend, Lina Daniel, to write one." Dr Hutter adds: "I also want my daughter to know that scientists are real people who pursue interesting scientific questions - and that anyone can become a scientist. I hope that Anna and Evan Meet Charles Darwin will be the first in a series of books for young children about famous scientists. "I chose Charles Darwin for the first book as I have been a Fellow of Darwin College, and also because he is so well known. But I'd like the next book to be about Marie Curie."